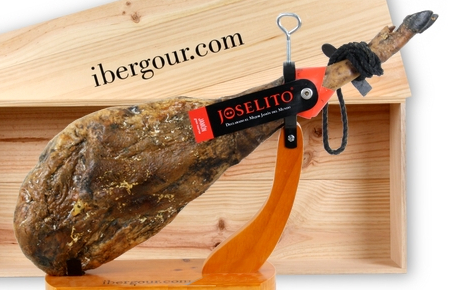 The most famous and recognized worldwide ham producer from Guijuelo just celebrated its 150th anniversary. Six generations have now dedicated themselves to ham processing, even though it didn’t bear the name Joselito for the first 100 years, when the current director’s grandfather realized its growing popularity. Joselito Ham has its own herd of almost 35,000 pata negra pigs, with a genetic selection that allows the recognition of a cut not yet labeled. Another characteristic is that the company doesn’t use additives, except salt. No artificial colors, preservatives or lactose – just acorn-fed ham and salt. The company that José Gómez currently runs has opted for internalization, research and development and positioning as luxury items. A success that its competitors have lost no time in trying to duplicate. To celebrate it, 18 master cutters sliced several Vintage 2011 cuts (cured for more than 7 years) in an event that took place in Madrid’s Teatro Real on October 2, 2018. It was one of the hams that we first sold at IberGour. We incorporated it into our catalogue at the end of 2006, and we can confidently say that it is a brand that creates loyal customers. In spite of some specific disappointments, the more than 300 opinions that have been sent to us and we have published prove our customers’ love for the jewel of Guijuelo. Next Next post: What does Reserva mean when talking about ham?